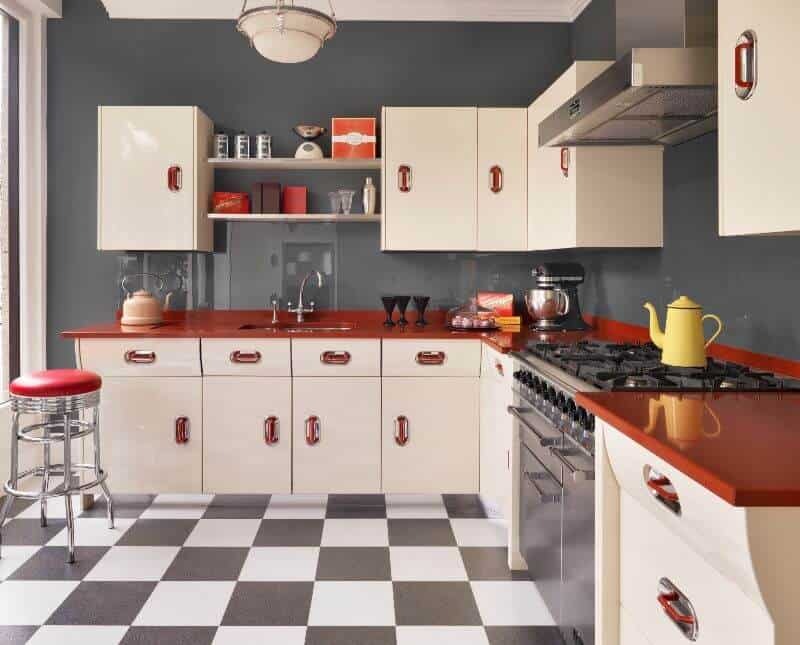 If you are looking to bring some energy and personality to your new bespoke kitchen, but are unsure if you want to go all out with brightly coloured cabinets and worktops, then choose timeless neutral cabinetry and bring your kitchen to life with eye-catching pops of fun colour. Understated units are the perfect canvas to experiment with colour accents. 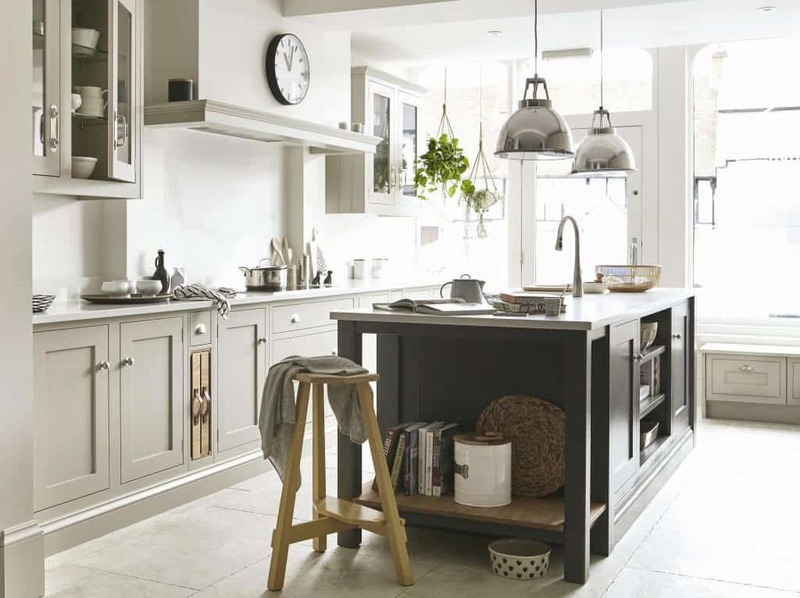 A good kitchen design is about YOU, and this can be reflected in the smallest detail. Feature splashbacks and painted cabinet interiors are the way to make your kitchen come alive. 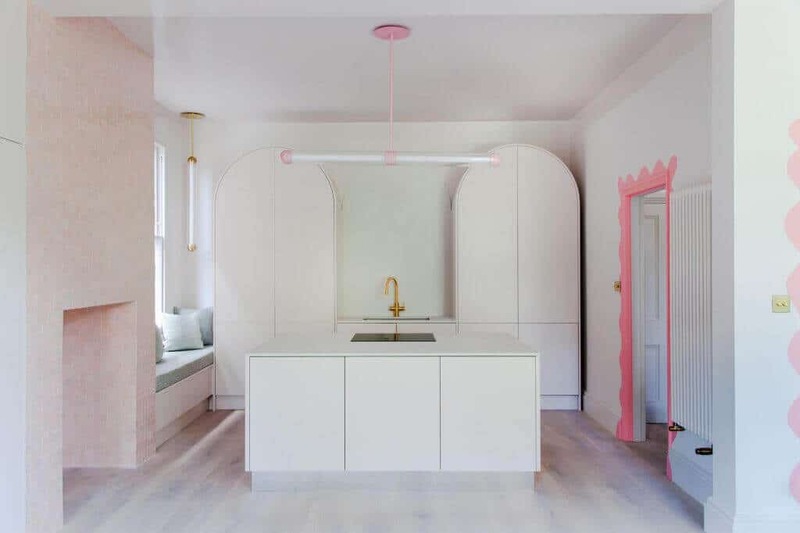 Painted kitchen cabinet interiors are a fantastic way to add a splash of colour to a neutral kitchen. Feeling adventurous? 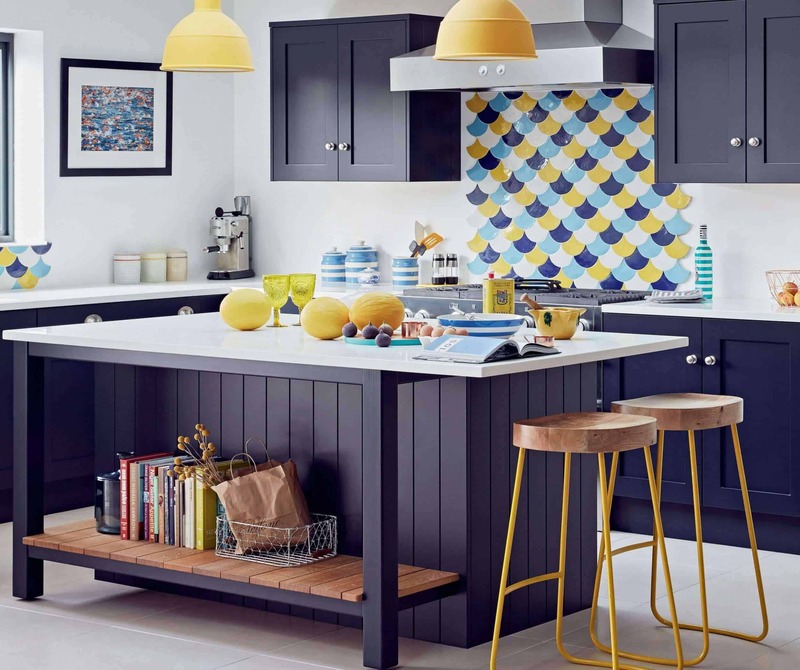 Then match your interiors with a vibrant coloured splashback or island worktop. 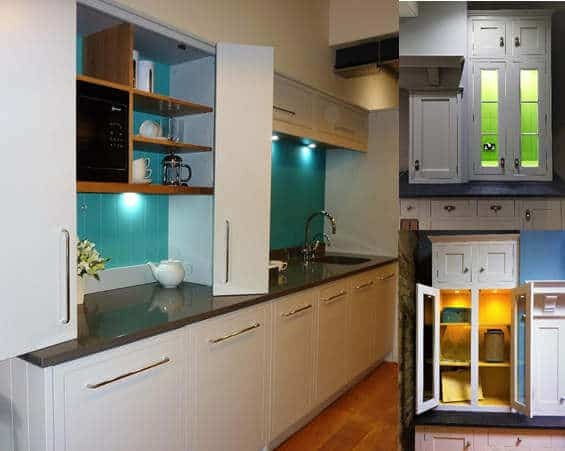 A bold colour inside cabinets will give an instant brightening effect and teamed with some spotlights or LED’s, can be turned into a focal point of your new kitchen. Choose striking colours such as bright greens, blues and yellows to really grab attention. 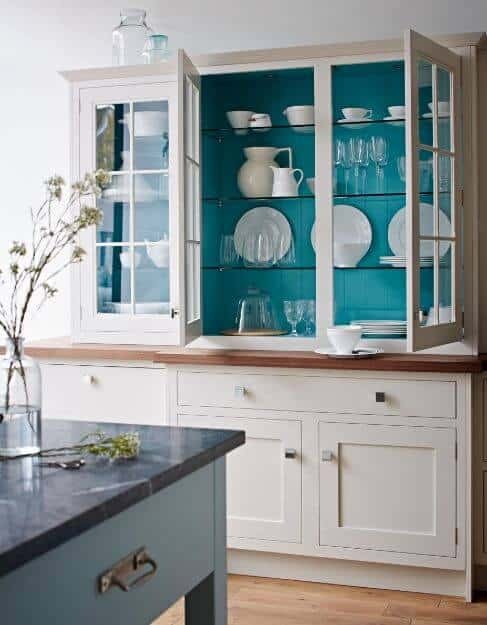 If you want to show off your stunning dishware, paint the inside of glass-front cabinets. Painting the interior of white, glass front cabinets creates a dramatic background for kitchenware. Here an intense shade of blue is the perfect backdrop for the clear glassware and white dishware. 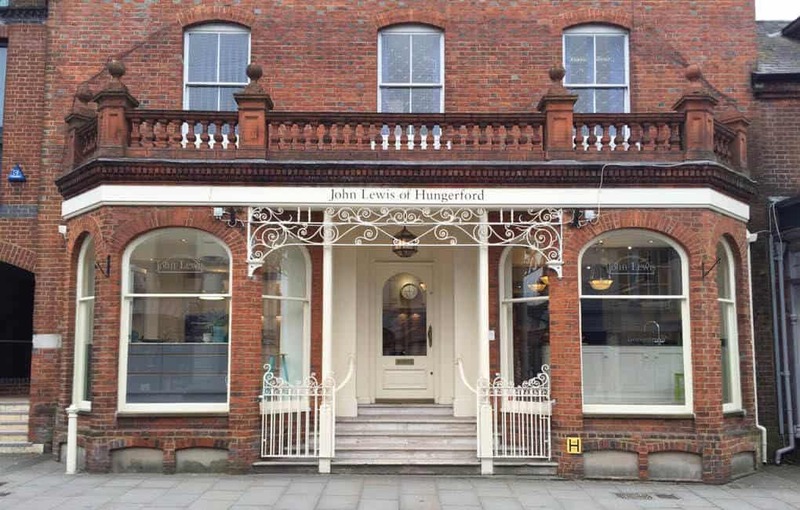 View our full range of bespoke kitchens, fitted bedrooms and furniture. 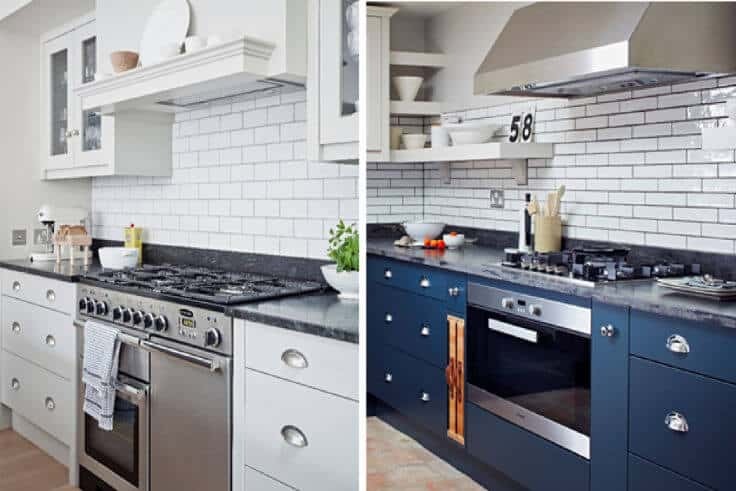 Splashback are no longer just used for protecting and maintaining the walls surrounding the work space, but are now being used in creative ways to give kitchens a rich injection of colour and character. 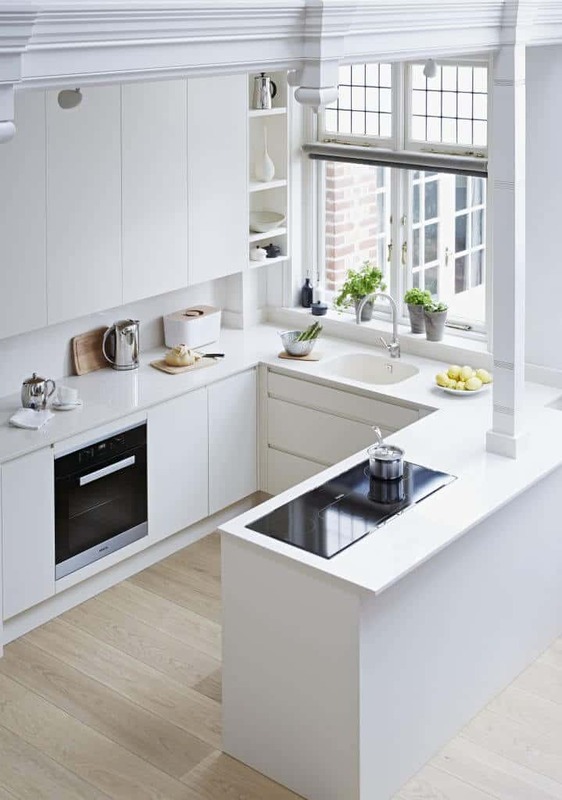 In addition to worktops, splashbacks are often the first element that’s noticed when walking into a kitchen. We recommend a finish that is easy to clean and heat resistant. Have a look at some of our top choices, below. Glass splashbacks create a seamless, contemporary look and work exceptionally well in our Pure style kitchens. Glass is a great choice for adding colour and ideal for allowing light to reflect beautifully around your kitchen. 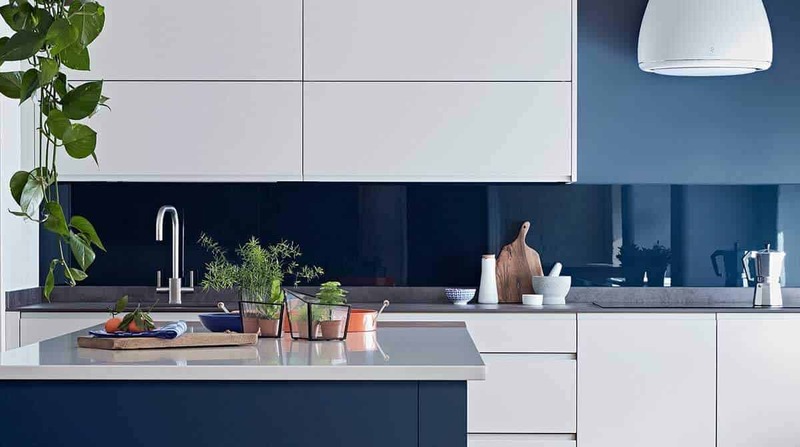 At John Lewis of Hungerford, we provide toughened glass splashbacks in a huge range of colours to complement your kitchen design, and with precision cutting they are a made to measure fit for any size area of your kitchen. Or why not go for something a little different, stand out from the crowd and experiment with a mirror splashback. 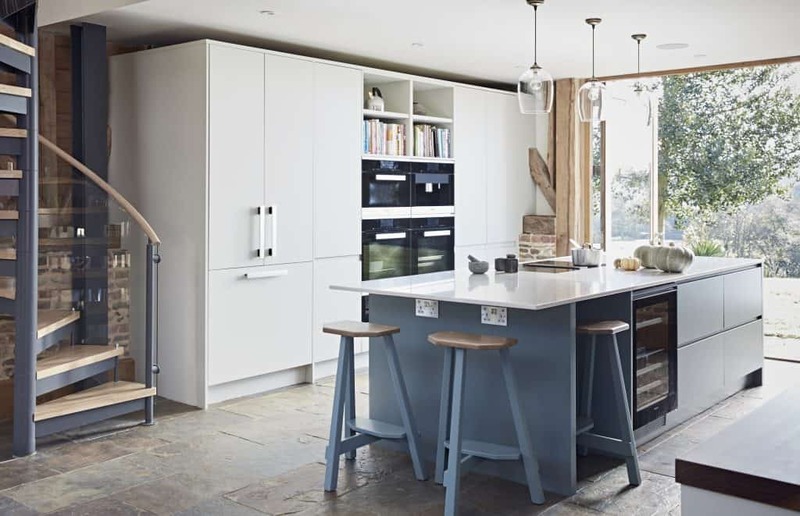 This is a simple yet extremely effective way to make your kitchen feel bigger than it really is. 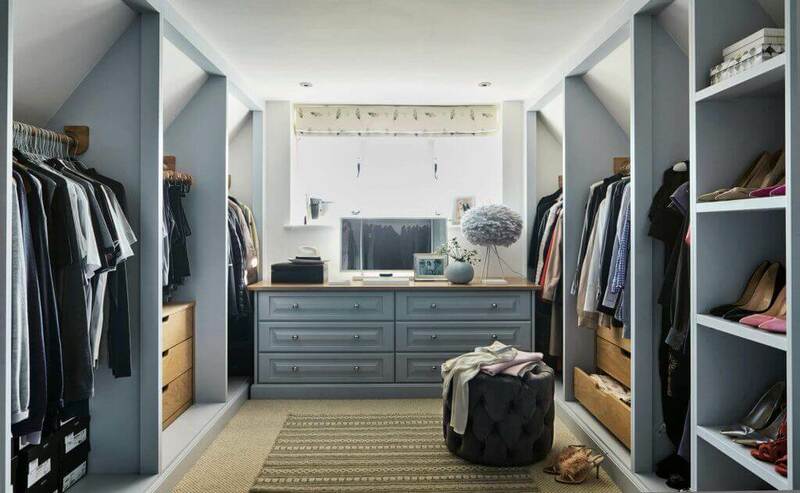 Plus, it can be a great way to introduce colour, especially if the mirror reflects a view through a window opposite, or a painted cabinet interior. Neolith splashbacks are the cutting edge of design and one of our firm favorites. It’s a porcelain product that is not only heat resistant and scratch resistant but is also impervious to UV rays meaning it won’t fade. So, you can throw open your kitchen windows and enjoy the sun. Neolith really does contain all the elements you would want with a kitchen splashback. Neolith can also be book-matched, a process where two pieces of the same stone slap are joined to create a mirrored pattern, creating a seamless design in your kitchen. This process was only previously possible using quarried marble which, as well as being expensive, is nowhere near as durable as Neolith. Neolith is also the ideal material for kitchen worktops. Neolith does a fantastic job of replicating Calacatta Marble. 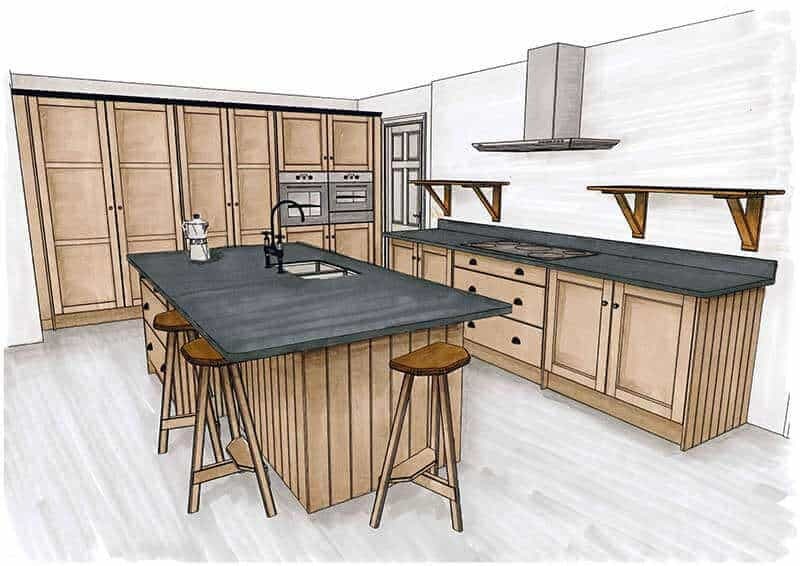 It works amazingly well with our timeless, original Shaker kitchen (pictured below). 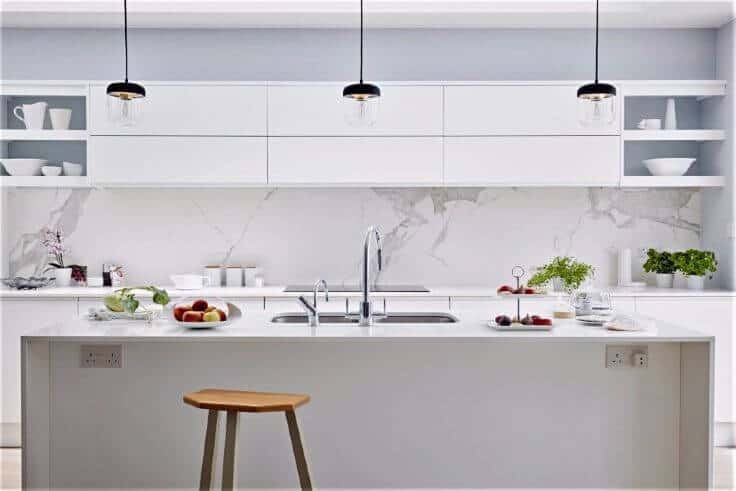 Neolith provides a wonderfully, sleek, modern design, which can easily be incorporated into traditional style kitchens, such as our Artisan & Shaker range, as well as Contemporary kitchen designs. Dare to be different, this is the year to add some rich, unforgettable luxury to your kitchen design. 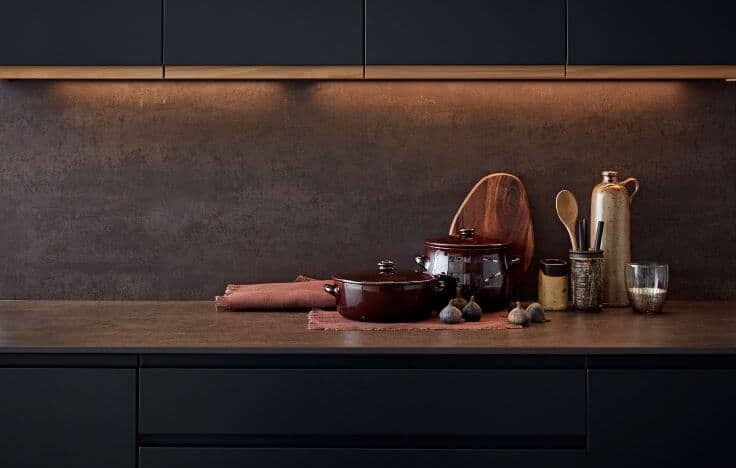 Iron Copper is another exquisite style of Neolith. Metallics exude opulence and sophistication giving your kitchen a truly rustic yet fabulously elegant feel. Tiles have always been the most traditional choice for kitchen splashbacks. They give a timeless look and with an endless array of different designs to choose from, they work well with all styles of kitchen. We love using classic square or metro tiles for a beautiful, yet understated way to shield your kitchen walls. A great option is a porcelain tile, with a contrasting grout, giving a sophisticated, classic look. Using exposed brick as a splashback brings a textural element to your kitchen and is a great way to warm up an all-white space. Here, bricks are used over the whole wall to create a dynamic combination of industrial and retro style. When used with our Urban range of kitchens as shown above, this type of splashback really completes the look and prevents the kitchen from being a sea of white.